What invents Mille Miglia 417 Special Edition 2015? Special the model more unique must be the way to bring it ahead. After all jumping right upon the specification for such a memorable Mercedes Benz Special Edition would be injustice to the victory attained 60 years back by a model with race number 417.Then production car 300 SL in the year 1955 at ‘Mille Miglia’ participated in the world’s most challenging long distance races with the race number 417. The race began at 04:17 am and after travelling 1597 km in 11 hours, 29 minutes and 21 seconds, this takes a journey from Brescia to Rome and back, the 300 SL marked the glory in golden words by acclaiming overall fifth stand and winner in the production cars. Not just first, the production 300 SL cars also took the second and third position in challenge.Now I guess the reason behind the SL Mille Miglia 417 Special Edition and the embarked 417 on its body is clear and just like us you too are now anxious to know about the model. Now let us talk about the features and looks. 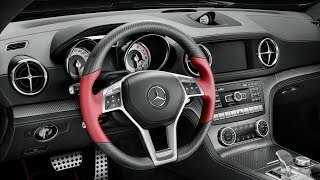 The Interior of Mercedes Benz SL Mille Miglia 417 Special Edition 2015 covers the gleaming contrast of red accents with either black nappa leather or with the carbon-fiber. Model comes with standard seats and just like the rest the black center console is adored with the red edging amidst the carbon fiber inlays. The interior gets this unique gift of embroidered ‘SL Mille Miglia’ logos on the carbon fiber like embossed structures headrests. Apart the Red edging significantly covers the interior leaving marks right from the floor mats till the sports steering. The Exterior of SL Mille Miglia 417 Special Edition comes in night black magno matte paint finish with red accents at certain intervals. Model comes with AMG bodykit and AMG wheels as standard. The night dark front bumper features the red aerodynamic lip while the same blend kissed the rear spoiler, brake calipers and the arena around the 19 inch performance wheels in front and 20 inches at rear. Just like the embroidered tag in interior the exterior too holds the ‘SL Mille Miglia 417’ mark on each of its side gill. The SL Mille Miglia 417 special edition is just for the SL400 and SL500 (also known as SL550). The SL400 is powered by a twin turbocharged, 3.0 liter V6 engine producing 329 horsepower and 481 nm of torque while the SL500/550 works upon the 4.7 liter twin turbocharged V8 engine producing 429 horsepower and 700 nm torque. Both these models are paired to seven-speed automatic transmission and come with ABC air suspension as an option.